Joyland is an example of an early British seaside amusement arcade. Located in Bridlington, East Yorkshire, it developed over the years to become the town's largest amusement arcade and the most visited commercial tourist attraction in the town. Joyland was primarily developed by three generations of the Brown family, who turned a collection of seafront shops, yards and other buildings into a major palace of fun. The arcade also featured stalls, games, rides and many other entertainments. 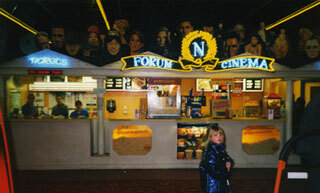 In more recent years, Joyland has been under the ownership of J. Noble & Sons Ltd, and renamed The Forum. Besides the slot machines in the massive arcade, it includes bars, restaurants, ten-pin bowling and cinema among its range of attractions. Click here for some photographs of the Forum which were deleted from the final version of the book.